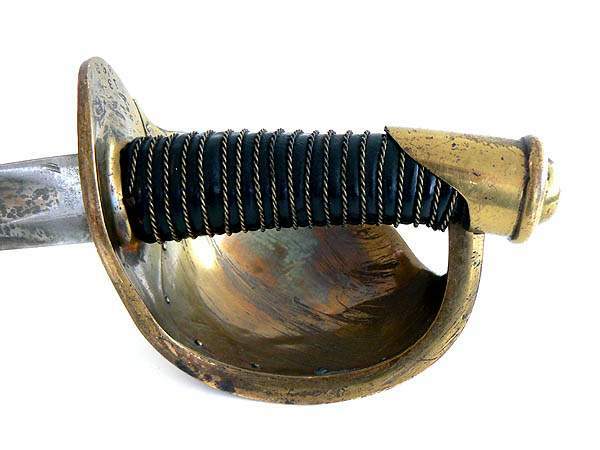 To view our current inventory of sea service, military and Civil War swords and arms, click here! Presented is an Ames, Civil War, M1860 cutlass which is missing its scabbard. The blade is properly marked with the Ames shield showing partially on the reverse and the 1861 date on the obverse. Missing are the customary inspector marks or rack marks, wire wrap and leather on the grip, but the Ames serial number 4M934 is present on the back inside of the top of the guard. Overall, there is evidence this cutlass has seen some serious use. These cutlasses have become so hard to find so that even in this grade they have become a rare find. This one is priced to reflect its shortcomings. CONSTRUCTION OF GUARD: The knuckle bow has a flange which accepts an elliptical guard which acts as a hand shield. Most if not all of the original varnish is gone. The curved hand shield is riveted to the flange and forms a solid half basket guard. The leather covering over the wood grip, and wire wrap have been worn off. 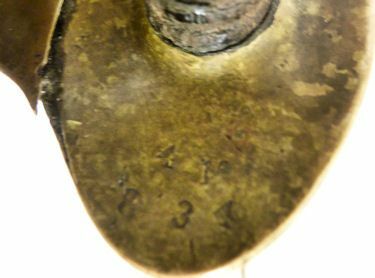 MARKINGS: For the perfectionist, the main fault with this cutlass is that over the years the maker's mark is hard to see and much of it has worn away. There are no U.S. Navy imprints showing it was inspected or rack marks showing it saw military service. The Ames serial number assigned to this weapon and reads as 4,734 out of the 25,000 delivered, including contract extensions so it was made early enough to have seen service in the Civil War. BLADE CONDITION: In addition to what has been described elsewhere, the blade and all individual parts are tight and correct. The blade is sharp and has a mottled Grey finish. The scabbard is missing. This is a worthwhile example of an Ames, Civil War Cutlass and will be appreciated by those who value historic weapons! International buyers welcome, but must inquire first. You are responsible for knowing your country's import laws covering edged weapons. We have satisfied customers in Argentina, Australia, Austria, Belgium, Bermuda, British Virgin Islands, Canada, Chile, China, Czech Republic, Democratic Republic of Congo, Denmark, Estonia, England, France, Germany, Greece, Holland, Hong Kong, Hungary, Iceland, Ireland, Israel, Italy, Japan, Kuwait, Latvia, Martinique, Mexico, New Zealand, Norway, Nova Scotia, Panama, Poland, Portugal, Puerto Rico, Russia, Romania, Saudi Arabia, Scotland, Singapore, Spain, Sweden, Switzerland, Thailand, Turkey, United Arab Emirates, USVI and the Eastern Caribbean. Copyright 2012 Land And Sea Collection™. All Rights Reserved! Presented is an Ames, Civil War, M1860 cutlass in far better than average condition considering its age and use at sea. It is a rare find, considering many of these cutlasses are either missing their scabbard or are being sold with one which is a replica. The condition of the accompanying scabbard is exceptional. It has the expected marks of age, but there are no breaks or deep cracks and it has its frog button. All 40 of the copper rivets running down the back are intact with the one larger at the tip. The knuckle bow has a flange which accepts an elliptical guard which acts as a hand shield. Most all of the original varnish is present, but shows scratching. The curved hand shield is riveted to the flange and forms a solid half basket guard. The guard, leather covering over the wood grip, and wire wrap are perfect. The Model 1860 cutlass which replaced the Model 1841 saw service during the Civil War, and through the Spanish American War. They likely were used during the early days of World War I. Based on company records, 22,000 of them were made for the Navy and 300 for the Army by Ames in two Massachusetts plants. The design for this cutlass was copied from the French naval cutlass used from before 1800 when boarding of enemy vessels was common place. The French affectionately called it "Cuillere-a-pot" (the soup ladle) and the comparison is obvious. MARKINGS: For the perfectionist, the main fault with this cutlass is that over the years the maker's mark and the U.S. Navy imprints have mostly worn off the blade. Remaining on the obverse ricasso is a lonely 186_, and on the inside of the guard at the top 13 M 962. There are no other marks discernible. The last number is the Ames serial number assigned to this weapon and reads as 13,952 out of the 22,300 delivered, including contract extensions. From the Chief of Naval Personnel Public Affairs WASHINGTON (NNS) -- The chief of naval operations approved a number of uniform changes as announced in NAVADMIN 118/10 March 31. Included in the announcement is the approval of a Chief Petty Officer (CPO) Ceremonial Cutlass for optional wear by E-7 through E-9s. Chief petty officers are authorized to wear the cutlass in full dress uniforms when acting as a member of an official party during a ceremony. However to ensure uniformity, all members of the official party must wear either the cutlass or the sword. Because this is an optional uniform article, Sailors are responsible for the cost of the item. Additional details on the final design and manner of wear of the cutlass will be released in a future Navy message. 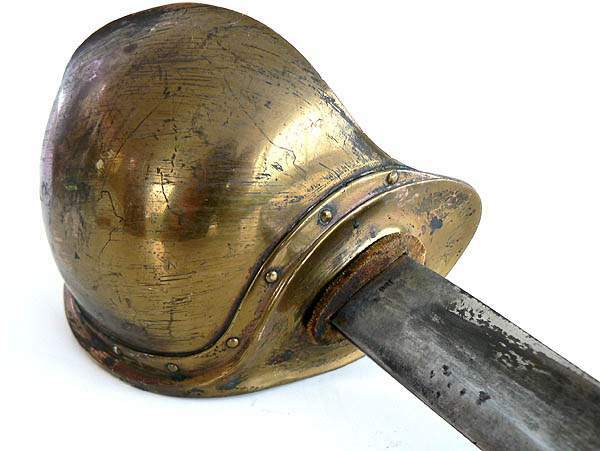 CONDITION: The entire hand assembly, guard and grip are in original condition with only scratches as the most minor superficial marks of age over the past 149 years. The patina of the varnish coated brass is pleasing to the eye. The leather is without imperfections and the two strand wire wrap is complete and tight. The blade and all individual parts are tight and correct. The blade has tarnish and patches of grey, and a series of six small nicks on its edge, just forward of its midpoint. The scabbard is of great value since it is impossible to find if missing. Original frog button, and correctly riveted scabbard with no shrinkage. Max width of blade 1 3/16" Max thickness 5/16"
This is an excellent example of an Ames, Civil War Cutlass and will be appreciated by those who value historic weapons! International buyers welcome, but must inquire first. You are responsible for knowing your country's import laws covering edged weapons. We have satisfied customers in Argentina, Australia, Austria, Belgium, Bermuda, British Virgin Islands, Canada, Chile, China, Czech Republic, Democratic Republic of Congo, Denmark, Estonia, England, France, Germany, Greece, Holland, Hong Kong, Hungary, Iceland, Ireland, Israel, Italy, Japan, Kuwait, Latvia, Martinique, Mexico, New Zealand, Norway, Nova Scotia, Panama, Poland, Portugal, Puerto Rico, Romania, Saudi Arabia, Scotland, Singapore, Spain, Sweden, Switzerland, Thailand, Turkey, United Arab Emirates, USVI and the Eastern Caribbean. This Weapon Has Been Sold. Thank you! 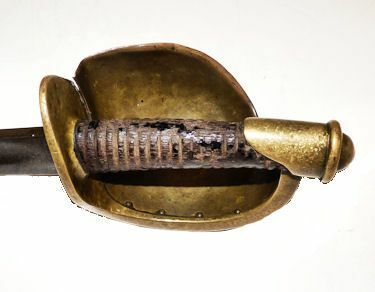 Presented is a first rate United States 1860 Naval Cutlass in its original copper riveted scabbard with most of its original varnish intact. The twisted wire has been worn off, but everything else is in excellent condition considering its 147 year age and use. The model 1860 cutlass which replaced the Model 1841 saw service during the Civil War, and through the Spanish American War. They likely were used on during the early days of World War I. Based on company records, 22000 of them were made for the Navy and 300 for the Army by the Ames Company in two Massachusetts plants. 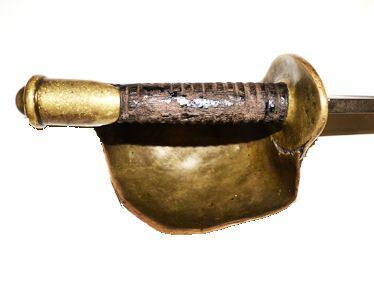 The design for this cutlass was copied from the French naval cutlass used from before 1800 when boarding of enemy vessels was common place. The French affectionately called it "Cuillere-a-pot" (the soup ladle) and the comparison is obvious. The cutlass with the plain guard was used by enlisted men and those with cutout U.S.N. in the guard were issued to officers, otherwise they were identical except for the initials. These weapons with a slightly curved blade were compact in design and amongst the most serviceable ever used in the American Navy. They were originally finished with a wire wound leather grip which wore away in use. No nation's cutlass served as long and was more efficient for close shipboard combat than this edged sidearm. CONDITION: Dated 1860 which can be seen by magnification. 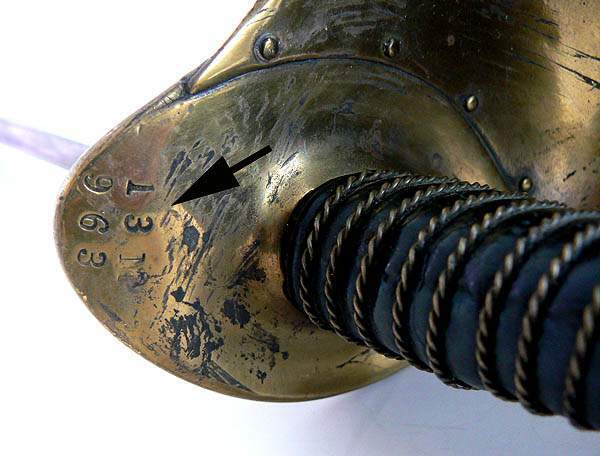 Other marks on both the blade and the pommel cap have been worn away or are hidden by pitting. 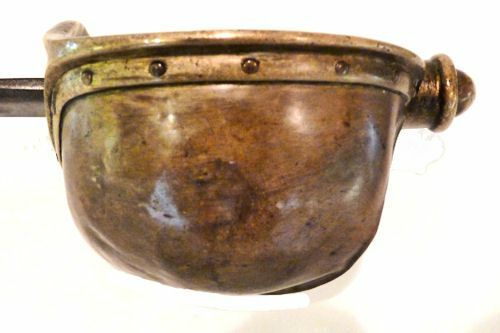 The brass cup-guard is slightly dented and shows typical age and deep patina of its original varnish. The blade is in excellent condition with very little pitting and is smooth to the touch. The grip leather is in excellent condition, but the wire wrap is missing. The scabbard has a loop missing on the reverse. 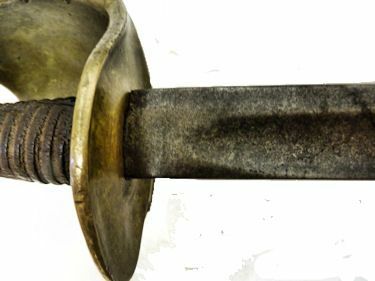 Considering its age and years of use this is a first rate cutlass and a scarce Civil War Period edged weapon with its original scabbard. INTERNATIONAL BUYERS WELCOME, but contact us first. We have satisfied customers in Australia, Austria, Belgium, Bermuda, British Virgin Islands, Canada, Chile, China, Czech Republic, Denmark, England, France, Germany, Greece, Holland, Hong Kong, Ireland, Israel, Italy, Japan, Kuwait, Martinique, Mexico, New Zealand, Norway, Nova Scotia, Saudi Arabia, Scotland, Singapore, Spain, Sweden, Switzerland, Thailand, Turkey, USVI and the Eastern Caribbean. 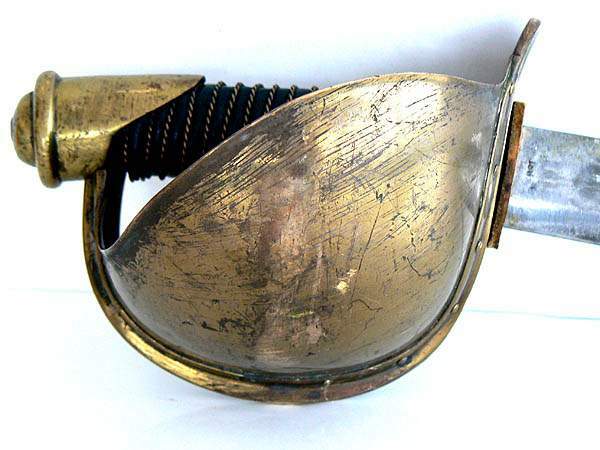 This represents an outstanding example of an antique sea service cutlass with a Civil War heritage. Buy this magnificent collector's cannon Now!